NOTICE ON THE RECENT FIRE. Advance schedule of Thanhouser releases not affected, a consequence of the saving of all negatives. Middle Western Stock has joined the California Stock at Thanhouser Company studio, Fairview Place, Los Angeles, where the two companies are producing three subjects a week. The home company is operating in New York City. The Thanhouser factory has been transferred to the Carlton Laboratory, where the entire product is being printed. The fire in no way interferes with business of the Thanhouser Film Corporation. Even posters for the releases will come, and, as ever, reach all exchanges on time. Whether one camera, missing its lens, was all that survived in New Rochelle, or whether two cameras, some scenery from Sherlock Holmes Solves The Sign of the Four, and a few other things survived, may never be known with certainty. 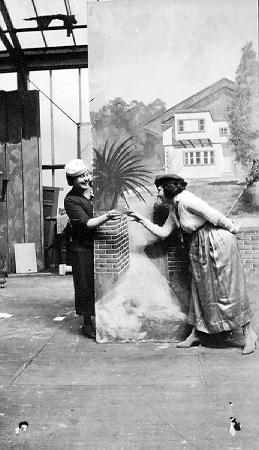 What is certain is that after the fire the Thanhouser Film Corporation had very little left in New Rochelle except the enthusiasm, talent, and ambition of Charles J. Hite and his employees. "For about five weeks I was greatly discouraged, but after that I started in fixing things up. I was too busy to worry. I had holders of Thanhouser stock approached and offered a price slightly above what they had paid for it a few weeks before. But they had confidence in us, and refused to sell. We had a small layout on the Coast, and all of us hustled out there. Instead of being out of work, these 200 Thanhouser people went at it harder than they ever did before. We had to contend with a number of difficulties in the way of heating, etc. but we never missed a release date. I'm rather proud of that," he added with a smile. The remaining members of Thanhouser's Middle Western Company, still on the road, traveled to Los Angeles, where they joined several dozen other Thanhouserites who were already busy turning out a variety of pictures. Fortunately, the Fairview Place studio in California was equipped with a new processing laboratory. Exposed film stock could be developed there, and production prints could be made for distribution. Plans to make Royal brand films Note for the Mutual Film Corporation were scrapped, and Francis ("Frank") Powell, hired to direct this new division, departed. The Moving Picture World, February 15, 1913, told of his leaving: "Frank Powell, formerly director for the Thanhouser company, has left that organization and is now kicking about footloose and fancy free. He had several opportunities to go to work as director with companies from the East, but says he likes California too well to leave. The probabilities are that a man of Powell's ability and reputation will not be allowed to enjoy much of a vacation." For Powell the lost Royal opportunity would not prove to be a handicap. He was to go to Powers, then to Pathé, and, within a few years, to set up his own production company, becoming in the process a well known figure in the industry. MYSTERY SURROUNDS NEW FILM. Because they prefer to wait until they attain perfection, the makers of a new film in California that will release shortly have withheld their identity in particular about the picture they are producing. On the latter score, the only information given out is to the effect that they have succeeded in obtaining some films that will be voted a revelation in production and photography. Further details, however, the makers of the new California picture are not anxious to make public until their product is ready for release. At that time, they state, they will be pleased to come forth into the open and stand or fall on the reception accorded their work. They prefer to do the preparatory work in quiet, without fear of disturbance. Indeed, their advertisement in last week's World was the first piece of publicity that they issued, notwithstanding that the work was finished in a first-class studio in the Land of Sunshine many weeks ago. It is stated by the producers that although their plans have been kept from the general public, exchangemen have inspected their first work, and almost two score of the Mutual group have ordered. The name of these exchange offices, and details on the kind of picture which the new company will soon ship them, will be given full publicity shortly. Thus far it is merely vouchsafed that a name has been decided upon for the new film, and it is "Royal." The business and professional men of this city should give every possible inducement to the Thanhouser Corporation and endeavor to keep the firm here. If necessary, special inducements ought to be made to bring this about. It would be beneficial to the entire community. In the meantime, Hite had agreed to purchase from Charles E. Maltby a building at 46 East Main Street known as the Columbia Garage, which measured 50 feet wide by 100 feet deep. 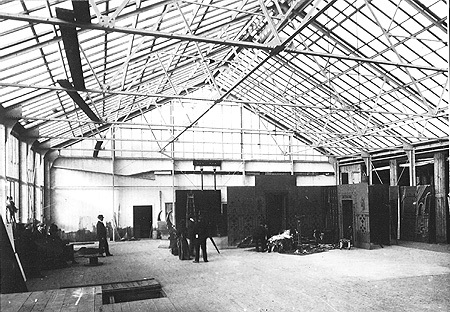 An additional piece of property extending to the rear was acquired, and plans were made to erect a two-story glass-enclosed studio. 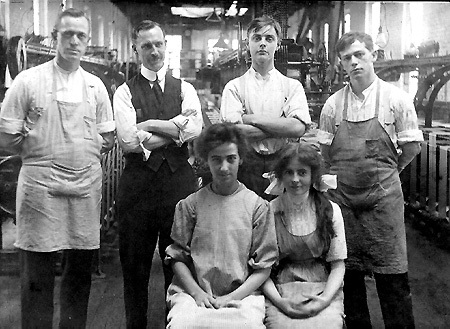 "This building is to be used as offices and as laboratories for developing and printing the reels," the same New Rochelle Pioneer account noted. "The laboratory equipment will probably be installed in the new place by the end of next week. The local company is working at the open-air theatre in Warren Street and Grove Avenue." Into the vacant Columbia Garage building the few items salvaged from the fire were moved. 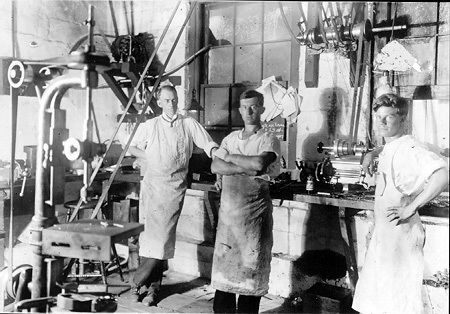 William E. Nelson, Thanhouser's chief mechanic, and Theodore Heise, superintendent of the old factory, worked day and night to acquire and set up film developing and processing. 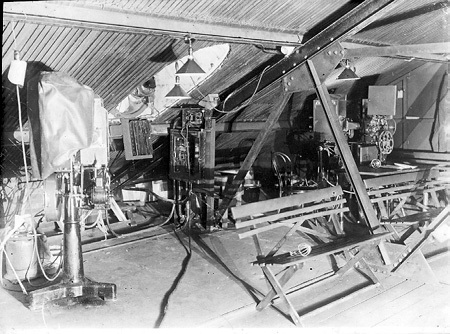 Using parts obtained locally, Nelson constructed a film printing machine. Meanwhile, outsiders were still offering inducements, and besides the $50,000 offer received from Waterloo, Iowa, a bounty of $60,000 was offered by Minneapolis. Note Realizing that the situation was still uncertain, despite the recent purchase of the Columbia Garage, the Merchants' Exchange of New Rochelle, an organization of local businesses, offered its aid in finding a site. To guide their search, Charles J. Hite stated that it was his preference that the studio be located near New York City, if not in New Rochelle, then in Mount Vernon, Port Chester, White Plains, or Yonkers. His frustration was mounting. At a meeting with officials of the New Rochelle Water Company he was told that he had to pay the same price as any other large private consumer, no matter what quantity he used, estimated to be about $3,000 worth a year. "In other places the public service corporations are more flexible, and we have been treated well by the lighting company in regard to light, if we locate here permanently," Note the executive stated. Meanwhile, on one front an expansion of the Columbia Garage was being discussed, while on another the avenue for moving the studio to another city was kept open. The Thanhouser Film Corporation has had prepared by Barnard and Wilder, architects, 46 Lawton Street, a set of drawings and specifications for a new central plant consisting of an office building which will have a frontage of 100 feet. In the basement of the office building are to be large fireproof vaults for the storage of films and other storage rooms for the safekeeping of literature, advertising matter, etc. On the first floor of this building are planned offices for the president, vice president, secretary, manager, assistant manager and the bookkeeping department, all conveniently located around a large foyer which will have easy access to the adjoining buildings. On the second floor are to be eight offices for the producing staff and three offices for scenario writers, conveniently arranged around a 20 by 40 foot waiting room for the photoplayers and other people awaiting assignments. The roof is to be of flat tile and arranged as to be adapted for staging outdoor effects. One end is to be fitted with a tank for aquatic scenes. The office building is to be connected with the main office building by a passage which will contain the main stairs and lavatories for the offices. By this general arrangement the studio building proper is semi-detached from the office building, which is very desirable as it gives additional light and air through the courts thus formed. 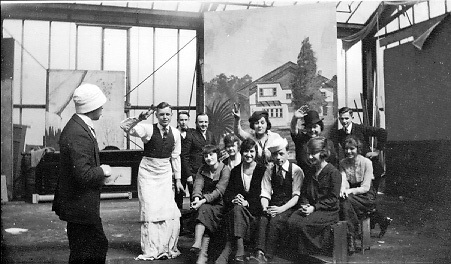 The studio proper is to be a unique building and when completed will have no rival in this country or abroad for commodious and comfortable appointments of the dressing rooms and the large space available in studios for the setting of scenes. In the basement of the studio building is to be a restaurant with kitchen accommodations. 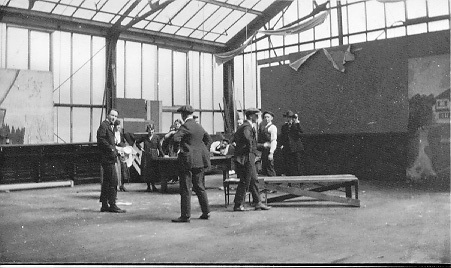 There are also numerous storerooms on this floor and, at the rear there is to be a paint shop and carpenter shop and the offices of the shipping department. On the ground floor level of the office building will be a dark studio, a room 80 feet wide by 120 feet long with a 22 foot ceiling, giving accommodations for eight sets and being fitted with all of the latest mechanical devices for lighting. Over the dark studio is the dressing room and lavatory story for the photoplayers. On this floor there are to be eight dressing rooms, each 24 feet by 34 feet, and each to be fitted with every accommodation and convenience and connected with lavatories, shower, bathrooms, etc. All these rooms are to be fitted up in marble and tile in pleasing designs. On the top floor of the studio building will be large daylight studio built entirely of iron and glass having a clear width of 80 feet and a length of 120 feet with a 40 foot clear ceiling in the center. The glass part of this structure is so arranged with luxfer prism glass as to concentrate the rays of light where desired at the will of the operator. At the rear of the studio building is to be a freight elevator of a size to accommodate a van or motor truck and with direct connection with all floors. At the side of the elevator will be another staircase from the bottom to the top of the building. From one landing of this flight of stairs a bridge is thrown across the driveway in the rear to connect up with the laboratory building which has a basement and three floors and is to be divided on each floor to accommodate the requirements of the developing and chemical departments. Opposite the laboratory building and at the rear of the studio building is to be located a power plant which is to contain boilers for furnishing power and heat generators for producing electricity and an artesian well with pumps and storage tanks and all other mechanical equipment necessary thoroughly to supply the building with light and power independent of any other supply. "The Thanhouser Film Corporation is a New York corporation, capitalized at $400,000, having on its board Crawford Livingston, New York City; F.F. McIlhinney, Waterloo, Note Iowa; Wilbert Shallenberger, Chicago, Ill., and C.J. Hite, New Rochelle. In addition to the above names, the stock is held by L.D. Rose, president of the Michigan Avenue Bank; R.C. Keller, president of the Colonial Trust & Savings Bank, Chicago; F.A. Farnham, cashier of the State Bank of Italy, Chicago; F.I. Chichester, president of the National Bank, Allegan, Mich.; Felix Kahn, of Kahn, Loeb & Co., New York City, and half a dozen other business and professional men of Chicago. It was purchased of its founder, Edwin Thanhouser, last April, for the purpose of controlling the output of this brand of film for the Mutual Film Corporation, a $2,500,000 organization, which has distributing points throughout the United States and Canada, the stock being owned largely by the officers of the Thanhouser Film Corporation. Its purpose is to purchase films of the manufacturers, whereby it will gain control of the program which it will offer as service in connection with merchandise to the theatres of the United States. At the present time, it is doing business which amounts to $4,000,000 a year, and in addition to this, supplies a program at a profit to distributing offices owned by other companies which would amount to about a million and a half a year. Its purchases from the Thanhouser Film Corporation alone amount to between $600,000 and $700,000 a year, which constitutes the business the Thanhouser Company does in the United States and Canada. "In addition to this, we receive royalties for the used negatives in Europe, Note which nets us an increase equal to a local business of $400,000 a year; therefore, the Thanhouser Company is at the present time is doing a business of a million dollars a year. It is the policy of the Mutual Film Corporation to purchase principally from a standpoint of quality. Those concerns which are allied to it have the opportunity, if they possess the facilities to produce quality, of increasing their output. Instead of releasing three productions a week, there is business available for the Thanhouser from 10 to 12. This would easily increase the income from $1,000,000 to $3,000,000 a year. "At the present time, we are disbursing for salaries and expenses for materials obtained locally about $6,000 a week. Acting upon the theory that our business, being increased three times, occasioned by facilities to warrant this increase, we believe that money disbursed in this town would approximate $20,000 weekly. In addition to this, it is probable that other companies of which the writer is an officer and stockholder would eventually be located in New Rochelle. This would further increase the amount of moving picture business that is brought to this locality. To avail ourselves of the opportunity it is necessary for us to equip a building large enough to house from eight to ten directors with producing organizations. The architect's preliminary estimate would necessitate the expenditure of about $200,000. "At the present time we have received offers from the Business Men's Club at Waterloo, Iowa, and Minneapolis, Minn., carrying with them a site as well as a cash bonus. The Commercial Club of Stamford, Conn., have offered us a site and an exemption of taxes for ten years. They have also requested us to give them an opportunity to make another proposition before we accept any. A member of the Commercial Club of Mount Vernon has shown us nice sites and requested us to give them an opportunity to submit a proposition before we decide on any other point. We prefer to stay in New Rochelle, and if the site we desire will be given us, we propose to carry out the aforementioned plans." Whereas the Thanhouser Film Corporation has in the past and now give much publicity to the City of New Rochelle by using the words MADE IN NEW ROCHELLE on its films wherever the same may be exhibited throughout the world and whereas said publicity has been of great benefit to the said city and whereas the said company is about to purchase property in the city for the erection of an extensive plant for the manufacture of such films at an approximate cost of $300,000 and the said company has a weekly payroll of $20,000 now, therefore be it resolved that this counsel does recommend that the said real property be for a period of ten years from the first of July 1913 exempt from the payment of all taxes and assessments provided this counsel may legally take this action. Be it further resolved that the corporation counsel be and hereby is requested to furnish his opinion as to the legality of such action at the next meeting of the council. HOW TO KEEP THANHOUSER: How to remit taxes to the Thanhouser Film Corporation is a matter that is puzzling the Council and Merchants' Exchange these days, and both are doing what they can to find some solution. The merchants have secured pledges to the amount of $5,000 and have been considering employing a collector to make a local canvass. Council President Cordial took up with others of the administration the plan of the city purchasing the site for the Thanhouser Company, leasing it to them at one dollar a year for ten years, and then selling it to them at the cost price. This was found to be impracticable. It is now suggested that the merchants contribute their $5,000 and as much more as they can raise and the city contribute $1,000 or $2,000 a year from the publicity fund until the site is paid for. Another suggestion is that the city pay the Thanhouser people $2,500 a year from the publicity fund for the advertising on all its films. The Thanhouser Company, having met with the recent misfortune, was placed in a position where they had to look for a new site. They decided that, when rebuilding, they would enlarge the plant. Plans are on foot to build a factory to cost about $200,000. After discussing the proposition, and looking over the State Constitution, I found a clause which is a great obstacle to the plan proposed by the Merchants' Exchange, which says that such an act would be illegal. I then got into communication with Corporation Counsel Mark M. Schlesinger, who said that he had found the same legal obstacle. I think it would be wise to defer the matter until we can familiarize ourselves with the law on the subject. Henry H. Todd added the comment that the proposed tax abatement was strictly a business proposition and that to have Thanhouser remain in New Rochelle would put more money in circulation in the city and would give employment to a new generation of citizens. After hearing further comments from the public the New Rochelle Council stated that additional discussions would be held at a future date. NEW THANHOUSER LABORATORIES. Thanhouser Film Corporation has established temporary laboratories at New Rochelle in the fireproof buildings at Main St. and Echo Ave. The new location is about as close to the railroad depot as the old and is one of the most improved pieces of factory in the city. The Thanhouser business office will remain a while in the Cooley Building. The new machinery that had been ordered for the old plant just prior to the fire will be put into the new laboratory without delay. The latter will not contain a single piece of wood other than office furniture. It took about two months to remodel the Columbia Garage and to add the studio on the back, creating a complete facility under one roof. The back of the structure, which contained four stages and looked like an oversized greenhouse, became affectionately known as the Glass Palace. Within the next year additional studio and laboratory facilities were constructed across Evans Street, the small alleyway which bordered the Glass Palace on the left. Behind the Thanhouser buildings an open-air stage was initially constructed on a wooden platform, soon followed by a second. Behind these was an inlet of Long Island Sound, with docking facilities. Immediately adjacent to the Glass Palace was Beacon Hall, a multi-storied brick apartment building at the corner of Main Street and Echo Avenue, which eventually became the home of many Thanhouserites. Across the street from Beacon Hall was the Pepperday Inn, a complex of buildings, which advertisements Note stated was under the proprietorship of Arthur H. Brunelle and had facilities for club meetings, private dances, banquets, etc. It was open all year and had single rooms and suites, with private bath if desired.